1. What happens to the solar energy which earth receives in such a huge quantity? We know conversation of energy theorem. So, is the energy of the earth is constantly rising? A part of energy what we receive gets reflected back to universe, and then what happens to the other part of it? Under the sun, we feel hot and that confirms that we are receiving the solar energy. In the same way, in night, we feel cold; reason is we are giving back the energy. 2. 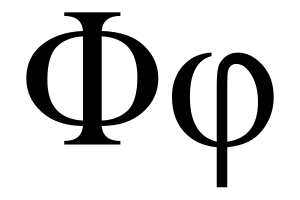 Why multiplications of 2 negative numbers yield a positive number? This is a very basic principle in mathematics which we all know and we are using it all the way from our childhood days. How this came and why is it true? In fact negative numbers are the reflection of the positive numbers (Their magnitude) about the origin in the number line. And while multiplying 2 negative numbers, their magnitude is multiplied first. For 2 negative sign, two times reflection is taken resulting in the product to be a positive number. 3. What might’ve happened if the earth didn’t have gravity? It’s impossible by the fact that anything which owes mass will have the property of gravity too. 4. Why concentration of air goes on decreasing as the altitude increases? Atmosphere is present in the earth because of its gravitational power and as altitude increases, force decreases and hence the air concentration will also decrease. 5. What might’ve happened if the earth isn’t tilted to 23.5◦ to its axis of rotation? Now even Robots can talk with each other…!!! If you’ve always feared that robots would one day start talking to each other and plotting the demise of the human race, you can start getting a bit scared right now. The folks over at the University of Queensland have come up with a way to get robots to communicate with each other. Instead of giving them a fixed language i.e. something we already know like English, researchers have given the robots the ability to come up with their own words to describe the situation it is in. The robots generate “words” from images of what they see with their onboard cameras. Called Lingodroids, these robots are designed to work together in a team to map out the area they are in. Whenever a robot encounters a new area, they store its location and give it a name using a word generated from its own language. The location and name is then shared with other Lingodroids in the area. The robots then add those discovered areas onto their own maps and are able to identify it by name. The robots can even travel to that particular location if given the instructions to from other robots. The single task they have to complete is to build a map of the world they are capable of travelling around on their three wheels. In order to do that they have a camera, range finder and sonar, and audio capabilities for capturing (microphone) and sharing (speaker) information. Whenever a Lingodroid encounters some new area they map it using SLAM (Simultaneous Localisation and Mapping) which involves making it memorable using a grid, landmark, and topological combination that remains unique. It’s very basic stuff in terms of communication, but it soon develops into a map with keywords the robots can say and the others can decide to travel to, or at least add to their own internal maps. It even extends to areas that cannot be accessed, and the robots can still give those areas a name. The next stage is to increase the spatial intelligence of the robots by allowing them to learn and give directions to specific places. If that works we’ll have robots acting like a GPS, but in a language we don’t understand. Google is indisputedbly the best search engine out there on the Internet, however there are a few ways by which you can customize Google and make it even better. Using OptimizeGoogle, you can get rid of text ads from Google search results, add links from about 10 other search engines, add position counter, product results and more. You can even filter your search results to see dead websites (using WayBack Machine) and remove click tracking so that you can search anonymously. Here is a list of some of the other useful features of this plugin. SearchPreview (formerly GooglePreview) will insert thumbnail view of the webpage into the Google search results page itself so that you can take the guess work out of clicking a link. Just install the plugin, reload Firefox and you will have the SearchPreview at work. You can install this plugin from the following link. This is a free browser plugin that gives safety advice about websites on the search results page before you actually click on the links. After you install the SiteAdvisor plugin, you will see a small rating icon next to each search result which will alert you about suspecious/risky websites and help you find safer alternatives. These ratings are derived based on various tests conducted by McAfee. Based on the quality of links, SiteAdvisor may display Green, Yellow, Red or Grey icon next to the search results. Green means that the link is completely safe, Yellow means that there is a minor risk, Red means a mojor risk and Grey means that the site is not yet rated. These results will guide you to Web safety. Ever wondered how to get free music or ebooks. Well here is a way to do that. To download free music just enter the following query on google search box and hit enter. Now you’ll gain access to the whole index of akon album where in you can download the songs of your choice. Instead of eminem you can subtitute the name of your favorite album. To search for the ebooks all you have to do is replace “akon” with your favorite book name. Also replace “mp3″ with “pdf” or “zip” or “rar”. The “intitle:” syntax helps Google restrict the search results to pages containing that word in the title. For example, “intitle: login password” (without quotes) will return links to those pages that has the word “login” in their title, and the word “password” anywhere in the page. Similarly, if one has to query for more than one word in the page title then in that case “allintitle:” can be used instead of “intitle” to get the list of pages containing all those words in its title. For example using “intitle: login intitle: password” is same as querying “allintitle: login password”. The “inurl:” syntax restricts the search results to those URLs containing the search keyword. For example: “inurl: passwd” (without quotes) will return only links to those pages that have “passwd” in the URL. Similarly, if one has to query for more than one word in an URL then in that case “allinurl:” can be used instead of “inurl” to get the list of URLs containing all those search keywords in it. For example: “allinurl: etc/passwd“ will look for the URLs containing “etc” and “passwd”. The slash (“/”) between the words will be ignored by Google. In a golden rectangle, it can be divided into a square and a smaller rectangle. The ratio of the width of the small rectangle to the width of the square is the same as that of the width of the square to the entire rectangle. In fact, when you divide a golden rectangle into a square and smaller rectangle, the smaller rectangle is a golden rectangle as well. 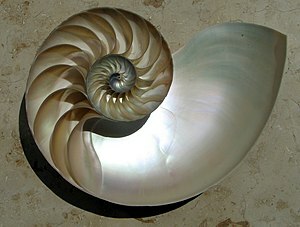 The most common example of the golden ratio is the nautilus shell (see image). As it spirals in on itself, the spirals get smaller and smaller in the same proportion to each other as they do to the whole. You can also see the ratio in things like sunflower petals, and the curvature of fern fronds (see image). Let’s look at the golden ratio, a little bit. You can verify these observations algebraically. What is one over the golden ratio? 1 / 1.61803398875 . . .=0.61803398875 . . . Does that answer look familiar? It is one less than the golden ratio. What is the golden ratio squared? (1.61803398875 . . .)2=2.61803398875 . . . Does that answer look familiar? It is one more than the golden ratio. I was trying to investigate chaos, and I drew the graph of y=x2-1. This parabola intersects the graph of the line y=x in two points. What are the coordinates of those two points? The points are (-0.61803398875 . . .,-0.61803398875 . . .) and (1.61803398875 . . .,1.61803398875 . . .). All four of those numbers should look familiar by now. Of course, the x and y coordinates are identical, for both points, as the points are on the line y=x. Notice the alternating signs. Each denominator is the product of two consecutive Fibonacci numbers. Where did I get this series? I deduced it from the fact that the ratio of consecutive Fibonacci numbers approaches the golden ratio, as the numbers get larger. The sequence of ratios of consecutive Fibonacci numbers is 1/1, 2/1, 3/2, 5/3, 8/5, 13/8,… We get the second element of this sequence with this series: 1+1/1·1. The third element is 1+1/1·1-1/1·2. The fourth is 1+1/1·1-1/1·2+1/2·3, and so on. This series was known long before I discovered it. The golden ratio can be represented as the simplest continued fraction (as shown on the left). This fraction is 1+1/a where a is 1+1/a. You probably evaluate such a continued fraction from the right side, and work toward the left, except that it has infinitely many terms. We can get a sequence from this by starting at the left, and evaluating only part of the continued fraction: 1, 2/1, 3/2, 5/3, 8/5, 13/8… These are the ratios of consecutive Fibonacci numbers. 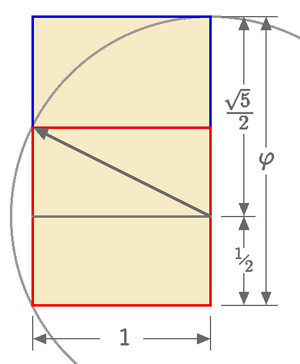 The golden ratio can be represented as a repeated square root, as in the diagram at the right. Evaluate this from right to left, too.